First things first, you need to understand how drinking water helps your skin. Drinking water leads to healthy, radiant skin in numerous ways. One way is by hydrating the skin. 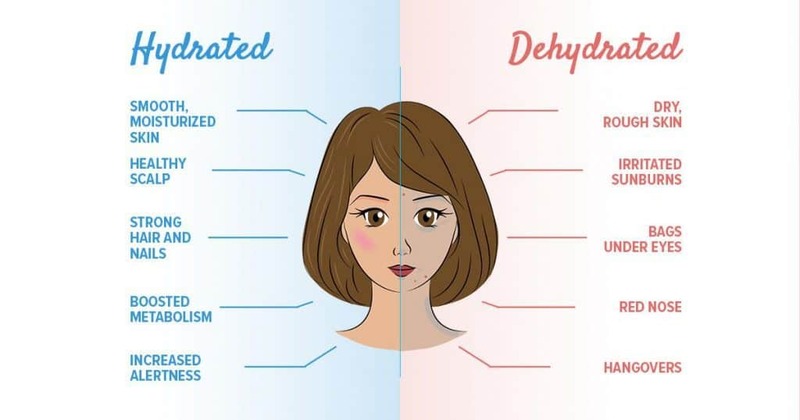 Hydration is vital to not only for good health (your organs cannot function without an adequate amount of water every day), but it is also vital for your appearance. If you become dehydrated from not consuming enough water, it takes a major toll on your skin. Dehydrated skin becomes dull and dry, sometimes to the point of irritation and cracking. You may think that slathering on a good moisturizer can remedy this, but even the best moisturizers on the market cannot save dry skin if the body is dehydrated. You need to hydrate yourself from the inside out by drinking an adequate amount of water. Making sure that your skin is properly hydrated by drinking enough water will lead to soft, supple, glowing skin! Another way that water leads to healthy skin is by ridding your body of toxins. Even if you live the healthiest lifestyle, toxins accumulate in your body no matter what. There are the toxins in the environment that you breathe in. There are the toxins you consume in the foods that you eat. There are the physical toxins that accumulate on your skin and in your pores no matter how often you wash your face. All of these toxins create awful problems for your skin. They increase oil production and clog your pores which can lead to acne. When it comes to fighting these toxins, water is your best ally. Drinking water helps your kidneys to filter toxins out of your system through urination. Adequate water intake also facilitates regular bowel movements, ridding your digestive system of this toxic waste. Basically, the cleaner you keep your body on the inside, the clearer your skin will be on the outside! While this likely seems like a large quantity of water, you should take into account how that water will be distributed throughout the day. Much of that water will help filter toxins from the body and pass through urination. If you lead a very active lifestyle or exercise daily, much of this water will pass through perspiration – which also rids the body of toxins. So if you want to start drinking your way to gorgeous, glowing skin, fill up your water bottle and start chugging! NOTE: It is important to remember that nothing is good in excess and it is possible to drink too much water. While we understand that you want to drink enough for clear skin, you should not drink more than a gallon of water in one hour’s time. Water consumption must be spread out throughout the day. Drinking more than one gallon of water in one hour’s time can lead to a condition called “water intoxication,” which can have serious consequences, such as coma or even death.